There really are very few ways to ruin Halloween, but chocolate covered brussels sprouts are pretty high up there on the list. We suppose your costume could rip, leaving you in nothing but your birthday suit (but TBH, not sure that would ruin the holiday). Perhaps your kid’s bag of candy gets stolen by a group of bullies (or worse, YOUR bag of candy), but then you’re kind of living out the trick-or-treating scene from Hocus Pocus and things turn fun again. But the worst, most detrimental thing that could ever happen on Halloween (probably) is if someone were to turn perfectly good chocolate into chocolate covered vegetables. Unless, of course, it’s a trick. Kids DO pose two options when knocking on your door — trick OR treat. One hilarious/horrible man came up with a trick for the neighborhood kids by offering them some homemade delicious chocolate balls as their treat. Except the delicious chocolate balls aren’t actually delicious. 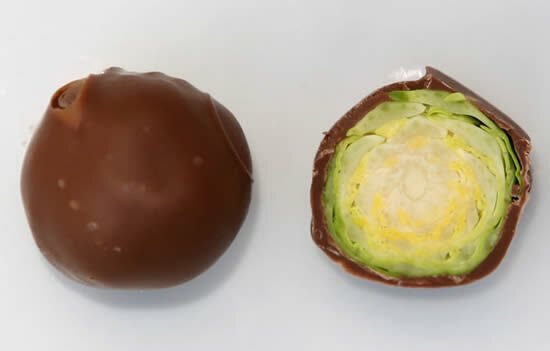 The chocolate is the outer shell to a child’s worst nightmare — a brussels sprout filling. The Halloween prankster is Mark Sparrow, and he tweeted his idea for the world to see. "It'll soon be Halloween so time to prepare some yummy treats for the neighbourhood kids," he wrote. "Try dipping Brussels sprouts in chocolate for them." Aaaand that’s exactly why kids should only eat candy given to them in sealed WRAPPERS. That and for other safety reasons, of course, but mostly because brussels sprouts could be lurking inside of any chocolate ball. Also, I know what some of you might be thinking. "Kids could probably stand to get some vegetables mixed in with all that sugar. Wouldn't kill them."